A devised performance created with a group of Looked After Young People (LAYP) exploring alternatives to conventional fairytale narratives. In 2014 Women & Theatre, in partnership with Birmingham Hippodrome, worked with 20 Looked After Young People aged 10-18 to develop and devise a new musical theatre production Once Upon a Time… which explored alternative endings to conventional fairytales. The concept for the piece was driven by the personal reflections of the participants, many of whom felt they had been sidelined by society and unjustly judged as ‘bad’. Over a period of over three months the group developed their ideas and dramatic improvisations into an overarching story about three witches who had been banished by a king and were looking for their magical talismans, and the King’s lost sons. Within this were individual stories, many of which talked about loss, or searching for a family. All the stories had been written by the young people. 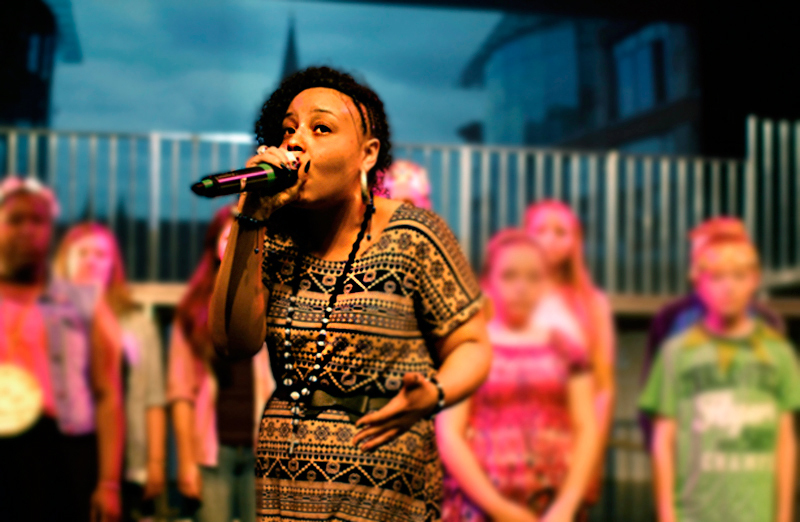 The performance, staged at The Patrick Centre in the Birmingham Hippodrome, took a unique urban perspective on the idea of the fairytale, creating an eclectic piece of musical theatre which wove rap, spoken word and lyrical songwriting into an energetic and humorous narrative. The effect of the project on participants was huge with many finding they had an increase in confidence, extended concentration and a greater sense of motivation in their lives. These thoughts were seconded by foster carers and agencies that saw massive changes in the young people they work with and reported a rise in school attendance from several of those involved in the project. This project enabled W&T to develop its work with Looked After Young People and strengthen its partnership with Birmingham Hippodrome, building upon the success of its 2013 project Loving Me. It also served as a reminder of the importance of working with disadvantaged groups and the overall benefit that arts projects can have on their lives. I thought there was absolutely no chance on earth that you were ever going to pull anything off – but you’ve shocked me and surprised me. Unbelievable. Miracles can happen. Yes the arts can make a difference to people’s lives – this was extraordinary and will have the power to transform these young people’s lives – amazing! Janice Connolly (Director), Sarah Wilson (Sound Artist), Kate Hall (Stage Manager). Once Upon A Time… was funded by Birmingham City Council, Children in Need, Eveson Charitable Trust, Edward & Dorothy Cadbury Trust and the Grantham Yorke Trust.